According to a study conducted by the Virginia Polytechnic Institute, after family, friends, and eulogy, flowers rank first among those who have lost a family member or friend as the most meaningful aspect of funerals. Furthermore, at a time of loss, recipients rank flowers and sympathy cards as the most meaningful of gifts. Those surveyed believe flowers and plants are a critical component of funerals, providing a necessary diversion, something to talk about, and a bright environment at a somber time. Asked to identify gifts and memorials that helped a great deal with grief, a majority of surveyed respondents named flowers and plants. Respondents also agreed strongly that looking at the cards to see who sent flowers is a comfort. Even when a charity or other organization has been selected to receive financial contributions in memory of the deceased, flowers are considered by most to be an appropriate expression of additional sympathy and support. Flowers can reflect many religious beliefs, including eternal life and rebirth. Your floral consultant is well aware of the differences between faiths and will assist you in this regard. There is a wide variety of floral tributes for every budget. Among them: bud vases; table arrangements; standing arrangements; sprays; casket drapes; wreaths; planters; and other designs which reflect a more personal aspect of the deceased, such as favored flowers, colors, and styles. Here, too, your professional florist can advise you. 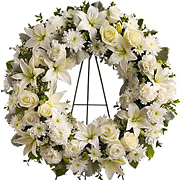 Among floral sympathy expressions, distinctive fresh flower designs and garden basket planters are becoming increasingly popular as they may be easily transported home after the funeral to serve as a comfort to the family. Other popular and thoughtful gifts are fruit and food baskets sent directly to the family at home.